In two days, Alpenglow leaves for Nepal to begin our expedition on Ama Dablam. Considered by many to be one of the most beautiful peaks in the Himalaya, Ama Dablam stands alone in the Solu Khumbu (Everest) valley, towering over the Sherpa villages of Thyangboche and Pangboche. “It is my favorite single mountain that I guide every year” expressed Alpenglow founder Adrian Ballinger, during a recent chat about the beauty, skill, and calculated risk Ama Dablam presents to its climbers. One last update from the Ama Dablam 2013 team…to add a little detail to the fantastic effort put in by Adrian and the Sherpa to open the route to the summit, and by the climbing team in achieving a 100% summit success. The team has all summited! Hello again from base camp. We have just enjoyed a couple of days of R&R all together in base camp in the sun…(albeit still in frigid temperatures!) in preparation for the task in hand. Although enforced rest is usually endured with chagrin, the team actually did pretty well at it this time! 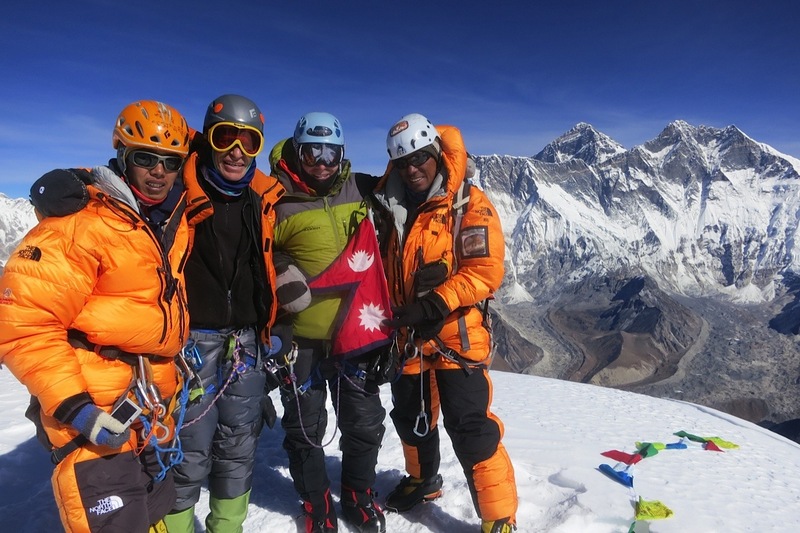 Photos from the rope-fixing team to Camp 3 on Ama Dablam! As promised…a bit more news from the team before it’s all HISTORY!